The word “Hyundai” comes from Korean word, “Hanja”, meaning “Modernity” . 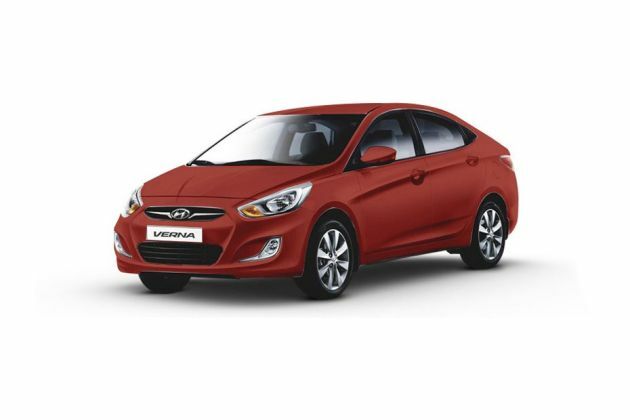 Hyundai India Limited is a wholly owned subsidiary of Hyundai Motor Company which assigned Mr. Mr. B.S. Seo, MD & CEO of Hyundai Motor India Limited to look in to roll out of successful models in India. Hyundai Verna Fluidic 1.6 VTVT EX is one of them. Korean Car major, Hyundai Motors launched it and marked with wide acceptance on success. Hyundai Verna 1.6 EX VTVT has winning modernity with its overall features. It is four doors car with sitting capacity of five, means Sedan and will capture your mind the moment you notice its quality. Hyundai Verna 1.6 EX VTVT has sleek aerodynamic shape. Hyundai Verna sedan comes with powerful 1.6-litre 121.4bhp 16V VTVT Petrol Engine of 4 cylinders has 16 Valve with displacement of 1591cc that produces maximum power of 121.4bhp@6300rpm and keeps a torque of 158Nm@4200rpm. It is fitted with special fuel system of MPFI and ensures good fuel economy at 9.8kmph in city and15.3kmph on highway, whereas overall mileage is 11.17kmph. It has tank capacity of 43litres. It can accelerate from 0 to 100Kmph within seconds. This is comfortable executive car that has five speed gear manual transmission and spacious cargo volume which can surely accommodate large amount of stuffs. Interior and exterior are above normal comparison in this beautiful sedan. This car redefines style, luxury and power. It offers good looks, advanced technology and dynamic safety features, this Sedan is an uppermost in quality which could be a revolution in car industry. Hyundai Verna 1.6 EX VTVT has remarkable exteriors and is brilliant by sleek look. Outer structure is based on aerodynamics that enables this sedan look sportier. It comes in six brilliant colors Crystal White, Stone Black, Sleek Silver, and Blushing Red, Deep Ocean Blue, and Champagne Gold. These colors are easily catchy and match with outer shape. Its exterior dimension combines its size which is Length 4370mm , Width 1700mm , Height 1475mm, Front Tread at 1495mm and Rear Tread at 1502mm on alloy wheel base of 2570mm covered with Tubeless Radial Tyre Size is 195 / 55 / R 16 and Wheel Size at 16inches. It ensures the ground clearance of 170mm and its kerb weight is above 100kgs. It has spacious cargo space matching with 400litres is available in this car. Hyundai Verna 1.6 EX VTVT can visualize in foggy weather with its fog lamps at front.The famous logo Hyundai is fixed in the centre of stunning chromed grille. The body colored bumpers enhances its looks. It is fitted with Power Adjustable Exterior Rear View Mirror, Rear Window Defogger, Wheel Covers and Outside Rear View Mirror Turn Indicators. Other features include Chromed Tipped Dual Muffler, Rear Defogger and Timer, Two Tone Chrome Rear Garnish makes it look beautiful and chick styled. Door Blackout Tapes with Blue Interior Illumination are extra features with this dashing sedan. Interiors of this Hyundai Verna 1.6 EX VTVT are really unique of this kind. It has Blue Illumination as we have already talked about. It is fitted with Air Conditioner with Heater to give full coverage within seconds. Magnificent feature involves High Gloss Black and Wooden grain Interiors, Power Windows with Driver Side Auto Down Time Leg, and it comes with fine quality Fabric Upholstery, Adjustable Steering Column, Tachometer, Electronic Multi-Tripmeter means Information display on Tripmeter and Glove Compartment is also fitted for storing other valuable things as well. It also comes with Outside Temperature Display and Digital Odometer. Integrated 2 DIN MP3 Player AM/FM 1 CD MP3 + USB Aux-in and this is surround sound with 4 Speakers at Front and at Rear, It adds to interior features with iPod Cable, Steering Mounted Audio Controls with Audio Hand Remote. Combining these entire interior features make this exciting car. Hyundai Verna 1.6 EX VTVT is powerful and latest generation 1.6-litre 121.4bhp 16V VTVT Petrol Engine of 4 cylinders has 16 Valve with displacement of 1591cc that produces maximum power of 121.4bhp@6300rpm and keeps a torque of 158Nm@4200rpm. It is fitted with special fuel system of MPFI and ensures good fuel economy at 9.8kmph in city and15.3kmph on highway , whereas overall mileage is 11.17kmph. It has tank capacity of 43litres. It can accelerate from 0 to 100Kmph within seconds . It contributes less to pollution by following Emission Norm Compliance on BSIV. Hyundai Verna 1.6 EX VTVT comes with Ventilated Disc at front and while Disc at rear. Other important feature is ABS (Anti-lock Brake System) electric Power-assisted collapsible steering and has Electronic Assisted Rack & Pinion and Turning Radius (wheel base) 5.2 meters. The Hyundai Verna 1.6 EX VTVT has front Suspension with McPherson Strut with Coil Spring and Rear Suspension with Coupled Torsion Beam Axle. It is fitted with Gas Filled Shock Absorbers. As far as braking is concerned, this sedan is fitted with Disc Brake at Rear and Disk Brake at Front. These features ensure this sedan will never skid out of control. Hyundai Verna 1.6 EX VTVT hasmore safety features. It has power steering wheel, front ventilated disk brakes and rear disk brakes mated with ABS, Central Locking, Power Door Locks and its MacPherson Strut, front Suspension with McPherson Strut with Coil Spring and Rear Suspension with Coupled Torsion Beam Axle. It is fitted with Gas Filled Shock Absorbers. This suspension and braking system permits you to control the vehicle easily . The Hyundai Verna 1.6 EX VTVT is packed with number of advanced safety features including engine immobilizer, Driver and Passenger Airbags, ABS with EDB and Engine Immobilizer, Front and Rear seat belts, Full Wheel Covers , Halogen Headlamps, Central Locking, and Front Fog Lamps and remote keyless entry. Side Impact Beams and Front Impact Beams easily provide safety to this car by any sudden heavy impact. Other features include, Passenger Side Rear View Mirror, Centrally Mounted Fuel Tank and Halogen Headlamps provide extra clear view for better safety. The Hyundai Verna 1.6 EX VTVT is stylish executive sedan car which is packed with lots of higher comfort and features. These include Comfortable Seats with Height Adjustable Front Seats, Electric Powered and tilt adjustable Steering, Front and Rear Power Windows, Remote Trunk Opener, Remote Fuel Lid Opener and Trunk Light. Apart from Automatic Air conditioner and Heater this car has Vanity Mirror and Automatic Climate Control, Rear Seat Headrest, Rear Seat & Centre Arm Rest and Height Adjustable Front Seat Belts. This car has enough legroom and shoulder room that is designed to provide comfort to all passengers. Other important features include are: Rear View Camera with Display on ECM, Rear parking Sensors, Bluetooth Connectivity with Steering Mounted Call Controls, Driver Information Display, Front Seat Back Pockets and Sunglass Holder. Moreover, it has Front Map Lamp to assist in locating and Alternator management System. Powered Petrol Engine, Stylish, Comfort Driving. Less Comfort Rear Seat, Interiors needs improvement.